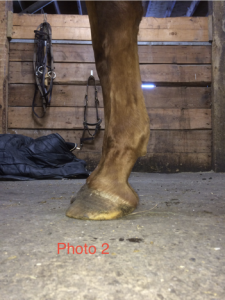 Abstract: 12 year old warmblood gelding, with previous injury to left fore. Tendinopathy remained and was reactionary to traditional treatments. Elected to integrate chiropractic and acupuncture care into maintenance schedule with positive results. 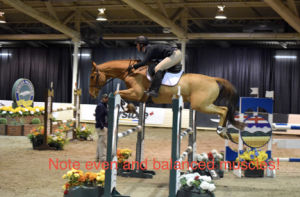 History and Presentation: “Lonestar” is a 12 year old warmblood gelding. He was in the USA at a 3-day event and presented to me upon return to Canada with a moderate to severe lameness. Differentials prior to examination included trauma / bruising of the limb, soft tissue injury from strenuous event. Lonestar suffered a longitudinal tear of his superficial digital flexor tendon (SDFT) (approximately 8cm distal to accessory carpal) of his left forelimb. At this time, rest, cryotherapy, and NSAIDs were employed. After 14 days, platelet rich plasma was introduced via ultrasound guidance into the lesion. He was rested and rehabbed over the following 12 months, with excellent client compliance to exercise, however intermittent lameness continued to plague him. Distal tendon sheath effusion was present intermittently. 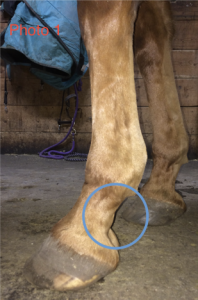 Local anesthesia to the tendon sheath confirmed the source of lameness to be inflammation within the tendon sheath. This was likely due to adhesions forming between the tendon and the sheath, and the repeated break down and aggravation of said adhesions. The tendon sheath was then medicated with hyaluronic acid and triamcinolone (10mg). Lonestar suffered an allergic reaction to the chlorhexidine soap used in the sterile prep for the synovial injection, leaving him non-weightbearing lame and on antibiotics and NSAIDs again. He was again rehabbed and conditioned and put back to work. His tendon sheath began to bother him again, however due to previous reaction the owner wanted to pursue alternatives to medicating the sheath. Chiropractic assessment and adjustment was undertaken, with favourable results. Acupuncture was added into his monthly maintenance visits. Upon initial presentation, Lonestar was standing with his left front limb pointed and slightly in front of his left forelimb. Myofascial palpation revealed ropiness through the long head of the triceps on the left. Neck musculature was tight bilaterally, with associated myofascial tie down throughout the cervical region. The second visit, his posture had improved, he was standing squarely with his front limbs, however there was a visible and palpable difference in the tone and position of his pectoral muscles. His left pectoral muscle was hypertonic and sensitive to palpation. The cervical myofascial restriction was improved compared with pervious visit. 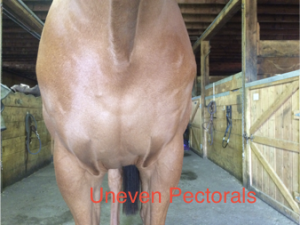 Follow up visits, the pectoral tone differential has evened out, and the cervical tension has almost resolved. 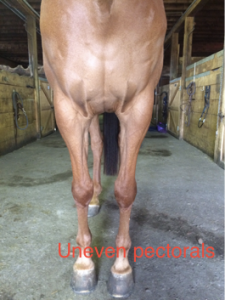 He has shown intermittent sensitivity in the triceps muscles on the left forelimb, but lately this seems to have resolved. Presenting complaint at the present time was intermittent inflammation and mild lameness of the LF (Photo 1). First series of adjustments included C1 posterior (vertebral body left), C3 vertebral body right, L3 vertebral body posterior and posterior-superior iliac spine right. Chiropractic adjustments: C1 posterior (vertebral body left), C4 vetebral body right, sternum left, T8 vertebral body posterior, posterior-superior iliac spine left and sacral base posterior right. Acupuncture points: Seirin needles (coated) J type 0.20mm x 30mm used in all treatments. GB21 to stimulate spinal accessory nerve and help with thoracic limb dysfunction. BL 10 bilaterally, to address poll tenderness, and also stimulate cranial cervical spinal nerves. BL 11-13 on the L to address cervicothoracic and mid-thoracic nerves of affected limb and also the hypertonicity in the left pectoral muscles. LU1 bilaterally to regulate tone in pectorals, increase shoulder mobility. LI16 on the left, for calming effect and again to modulate cervicothoracic nerves. Photo 3 shows the difference after treatment (after needles were removed). At the subsequent visit, the horse did not have restrictions in the poll, where as previous 2 visits I had adjusted C1 posters on the left. He showed a much more balanced physique, and the swelling in the tendon sheath was resolved (Photo 4). Owner reported horse had been even in his gait and had been more willing to work. No chiropractic adjustment was performed at this visit, just acupuncture as follows. Needle choice as above. GB21 to stimulate spinal accessory nerve and help with Thoracic limb dysfunction. BL 11-13 on the L to address cervicothoracic and mid-thoracic nerves of affected limb. LU1 bilaterally to maintain tone in pectorals, increase shoulder mobility. LI16 on the left, for calming affect and again to modulate cervicothoracic nerves. Following visits have continued to target the shoulder musculature, needling points SI11 and 12, stimulating suprascapular nerve, to aid in building of the muscles. SI9 has been treated to target axillary and radial nerve. Initial treatment was targeted at tenosynovitis, and muscle spasm through the thoracic sling. Going forward I would like to tackle the more distal points as the horse allows to modulate the distal flexors and increase blood flow to the tendons, for improved tendon health. Priority number one was to address the tenosynovitis seen at the first appointment. Due to the severe reaction previously, medicating the sheath was simply not an option. Ideally, I would like to treat SI3 however this horse is quite reactive and so I have not attempted this as yet. I would like to treat SI3 to directly stimulate the median and ulnar nerve more as the horse’s distal flexor group are double innervated. This horse’s original injury was to a distal flexor tendon, and so maintaining functionality and appropriate proprioceptive input to the spinal cord will be key in preventing re-injury. I would like to keep the functionality and balance of muscles that we have obtained so far. Again, ideally some distal points would be treated with this horse coronary points would be a “nice to have” – again current sensitivity and reactivity are preventing this. V – Vascular – could have interruption of normal vascular flow due to swelling, muscle dysfunction and limited range of motion. I – Infectious – unlikely – known traumatic injury. I – Iatrogenic Possible training inconsistencies resulting in one-sided muscle development, however unlikely as no asymmetry seen in back end. A – Autoimmune – immune dysfunction is on the list for the chlorhexidine reaction. T – traumatic – traumatic strain of superficial digital flexor tendon. Possible continued low grade trauma due to compensation. Myofascia – could have myofascial restriction throughout cervical spine leading to restricted motion in neck and Thoracic girdle. Lonestar’s response to treatment has been extremely positive. He is back in the jumping ring (photo5) and doing his job. He is in an excellent conditioning program, which I feel has made a significant difference to the outcome of this case so far. One article looking at tendinopathy in humans stated that “We would suggest that there is a small but high quality contingent of evidence supporting the theory that acupuncture may be able to influence tendon healing by increasing blood flow via local vasodilation and increasing collagen proliferation.” 1. The authors suggest that the “effects are most likely a result of an increased release of the neuropeptide CGRP from sensory nerve endings and an increase in mechanical signalling through the extracellular matrix respectively”. This would at least suggest evidence for the use of acupuncture in this case, and could be a possible explanation for the sheath swelling resolving so well. Maybe the increased blood flow allowed some healing of the chronic part of this injury to heal. Two rat models investigated the response of tendon healing using manual2 and electroacupuncture3. Whilst both of these studies were in the acute rather than chronic phase of tendon healing, increased cellularity, reorganization and fibre last growth factor were reported. It is reasonable to suggest then, that acupuncture may promote cell function and tendon repair in a chronic case, as well as an acute case. This may occur via reduction in mechanical hypersensitivity through effects on neurotransmitters, neurotrophin expression4, and neuromodulation5 as postulated in other studies. Clearly, the cellular benefits of acupuncture on cellular modulation can be argued in this case, for both the acute and chronic parts of this injury. In addition, acupuncture has been shown to be helpful in ameliorating muscle atrophy6. Again then, the argument can be made in this case for the continued building of shoulder muscle, which historically had been lacking in this horse since the original injury. Plan will be to continue to treat this horse to ensure even muscle growth as he continues to train. 2. de Almeida MD, de Freitas KM, Oliveira LP. Acupuncture increases the diameter and reorganisation of collagen fibrils during rat tendon healing. Acupunct Med 2015;33:51–7. 3. Inoue M, Nakajima M, Oi Y, et al. The effect of electroacupuncture on tendon repair in a rat Achilles tendon rupture model. Acupunct Med 2015;33:58–64. 4. Soligo M, Nori S, Protto V, et al. Acupuncture and neurotrophin modulation. Rev Neurobiol 2013;111:91–124. 5. Ju Z, Cui H, Guo X, et al. Molecular mechanisms underlying the effects of acupuncture on neuropathic pain. Neurolo Regen Res 2013;8:2350–9. 6. Akiko Onda, Qibin Jiao, Yasuharu Nagano, Takayuki Akimoto, Toshikazu Miyamoto, Susumu Minamisawa, Toru Fukubayashi. Acupuncture ameliorated skeletal muscle atrophy induced by hindlimb suspension in mice. Biochemical and Biophysical Research Communications. Volume 410, Issue 3 (2011) 434-439.